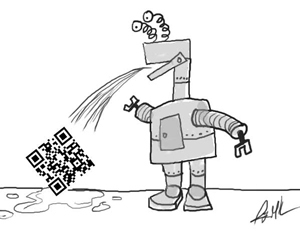 Unless you don’t shop or read magazines, you should know what QR codes are by now. QR codes have been around for over 5 years. But if you haven’t come across one yet, they usually look like a small, square, black and white pixelated image. They can usually be found printed on products, in magazines, on signs, business cards, and many other areas. Why Are QR Codes Used? They are, quite frankly, a short cut to the web from a printed source. Using a QR code reader that can be installed for free from the Apple store or Google Play, these codes can be scanned in a matter of a few seconds and be brought to a place the advertiser would like you to see. For example, the QR code can be a link to product details, contact information, an electronic coupon, a social media profile, a YouTube video, or a mobile friendly website. Why the Debate About Their Use? If a company uses a QR code in their billboard advertising or subway poster ads, these would not be the best areas for using them. Driving or in a subway tunnel with no reception would definitely not be the best places to use them. QR codes should be placed in print where the customers would be in a relaxed and settled atmosphere where they have access to their phone without harming themselves or anyone else. A complaint that I’ve had for a long time is that a native QR code reader app is not included with the phone’s apps. Most of these apps are free but it involves a step that adds a level of confusion to the process. If an app was included with the phone when purchased, I think there would be an increase in usage. Some people may not trust a QR code as there have been some that have linked to malicious malware. You would always want to make sure that you know where the code originated from, like a business card, or magazine ad. If you see a code and you were not sure what its associated with or where it came from, you’re taking a chance. How Should QR Codes Be Used? First, QR codes should be created with two things in mind: where it will be placed and what state of mind and environment the end-user will be in. Printed magazines, business cards, products on shelves, and new and used car window stickers are examples of good QR code use. These can all be used while you’re either sitting at home or browsing through products at a store where phone use is not taboo. Second, if a QR code is going to be pointed to a website, it should be pointed to a mobile friendly website. With more businesses understanding that having a mobile website for their business is just as (or more) important than a regular desktop website, using a QR code to jump to a mobile site will be a much more pleasant experience. As marketers and advertisers understand these rules and do not abuse QR code use, I believe their popularity will rise.